We might not get the classic snow-dusted landscapes from the Hallmark holiday films here in Houston, but we like that our 70-degree Decembers mean ample opportunities to get our blood pumping year-round, regardless of the weather. Have you heard? Rollerblading is back. With the abundance of parks and paths Downtown, outdoors enthusiasts across Houston are lacing up their skates and hitting the trails. Several miles of hike and bike (and skate) trails connect the Allen Parkway and Memorial Drive bayou trails to Sesquicentennial Park and the Northside Trail near the University of Houston-Downtown. The Buffalo Bayou Trail is fully paved and rated four stars for inline skating by the nonprofit traillink.com. The outdoor ice rink at Discovery Green powered by Green Mountain Energy is back. 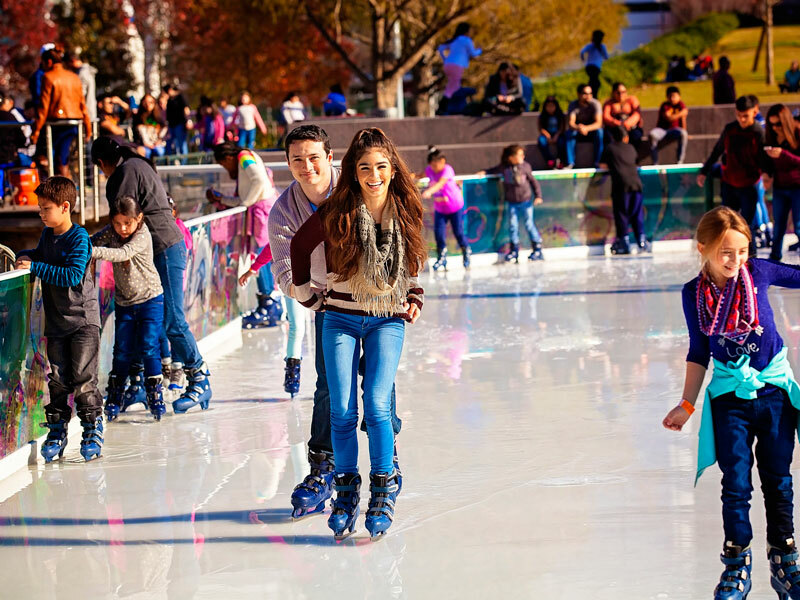 Houstonians can enjoy family-friendly time on the ice through January 27, 2019 for just $14.00 per person (including tax and skate rental). In addition to the 7,716-square-foot main rink, you’ll find outdoor movies, a live DJ and a toddler-friendly Ice Box rink for the little ones. Individuals in wheelchairs are invited to participate using a non-motorized wheelchair and accompanied by an able-bodied adult. Visit discoverygreen.com for a schedule of winter events. You’ve heard of the 12 Days of Christmas, but what about the 12K of Christmas? Join the Houston running community on Saturday, December 22, 2018 for a Christmas-themed 6K or 12K. Starting and finishing at Sam Houston Park, this race has something for the whole family to enjoy, including a Kids K race division, hot cocoa, appearances by Santa and his elves, Christmas carolers and more. All participants will receive a t-shirt and finisher’s medal, and are invited to join the post-race party for food, drinks, music and holiday festivities. To register, visit houston12k.com. 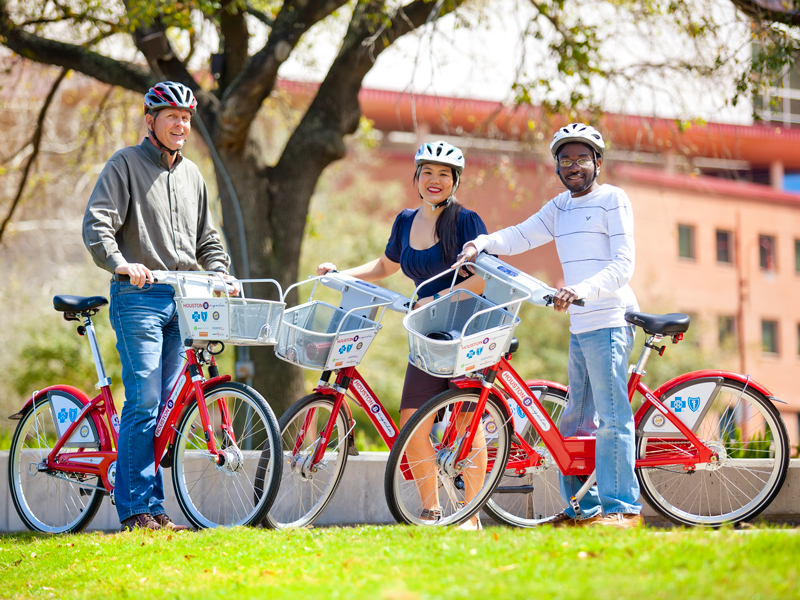 This past August, Houston City Council approved a $300,000 expansion for the bikeshare program, Houston BCycle. The expansion included 31 new stations and 337 new bikes across Houston with concentrations in Downtown and near local college campuses. Which means, you’ll have easier access when you’re cycling Downtown this winter. For a map of stations or more information, check out houston.bcycle.com. If indoor cycling is more your speed, Ryde’s indoor cycling studio at 802 Rusk. is modern and beginner-friendly. Memberships come with perks like a private locker and early booking. For folks who aren’t quite ready to commit to regular classes, there are pre-pay options for five, 10 and 20 sessions that are good for up to one year. If you’re looking to sweat without moving much, a sauna is your best bet. The Tellepsen Family Downtown YMCA at 808 Pease. offers a top-notch example. Citywide YMCA memberships cost $62 a month, with discounts available for seniors, students and young adults.